Industrial twin blade lumber edger with 30HP electric power, two movable 16” carbide-tipped blades, 36” max flitch width, 4” board thickness, 28” max finished board width, optional setworks, and up to 111 fpm feed system. The EG400 is a rugged board edger that is at home behind industrial headrigs or other applications requiring a fast, accurate heavy-duty board edger. Capable of processing material up to 36" wide and 4" thick, it is equipped with an automatic variable speed feed that is set by the thickness of the piece being edged. The 30HP is powerful enough to rip through thick hardwoods, but not big enough to break your energy budget. Two 16" inserted carbide teeth blades are mounted on a splined shaft and move in and out from center, allowing the use of an optional board tailer. Two lasers are included as standard equipment on the EG400, and it is equipped with anti-kickback protection and other safety features including a perimeter e-stop cable and electrically interlocked safety covers. 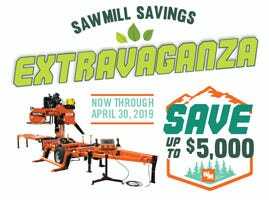 Yes, please subscribe me to receive email updates from Wood-Mizer. 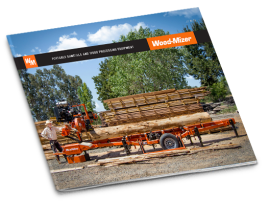 Be the first to hear about new products, promotions, customer projects, and more with our free Wood-Mizer Newsletter. Sign up today!